Summer Transformation Party- Instantly Beautiful Toenails Join us June 16, 2015 for a complete summer transformation party. We will feature our laser & Keryflex packages for over 50% off normal prices. Free pedicures and more. Onychomycosis, or fungal infection of nails affects about 12% of Americans, according to the American Academy of Dermatology. Current treatment methods have side effects and don’t work well. Fungus Laser Treatment offers significant clearing with no pain.The treatment to remove toenail fungus is quite simple, and involves directing pulses of light energy at the nail plate in a quick, in-office procedure. Why Do I Have Nail Fungus? Some people are genetically prone to it. Others, including swimmers and other athletes, may be more likely to get it because they go barefoot in public areas or because their feet are often damp. In its mild forms, nail fungus is merely a cosmetic problem, but over time it can cause toenails to grow abnormally and become painful when walking. Laser treatment for toenail fungus has no harmful effects on healthy tissue and targets only the infected area of the toe, the toenail complex. 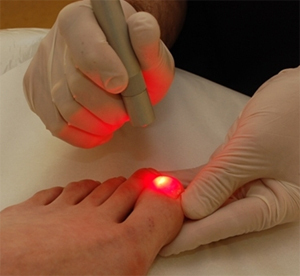 Laser treatment for toenail fungus, eliminates side effects of traditional oral medications, which carries a risk of liver damage, and works better than nail lacquer. During my evaluation of the infected nail(s) a decision will be made to debride the nail before the treatment. Some patients will need debridement and some won't. All toes will be evaluated for infection and be treated if necessary. On average, our laser is a 5 minute procedure. Whether you have one nail with fungus or more, we will carefully treat all infected nails to ensure that pathogens are vaporized. We are committed to providing the best quality laser treatment available to every patients. Thousands of patients have now been treated throughout the world. Results are showing that the vast majority of treated patients show significant improvement and in most cases, fungal nails are completely cured. On average, a toenail will replace itself every 9-12 months. Healthy new growth will be visible within the first 3 months as your nails continue to grow. The laser treatment will not cause your toenails to discolor or fall off.